As a child, I began to piece together what I wanted my future to look like. I just knew I could wish my behavior as a wife into existence. I would be intentional about the way I looked daily. No sweatpants, leggings, or messy hair for me! I would have breakfast and dinner piping hot before he woke up and when he walked through the door after work. Our home would be decorated, inviting, and spotless of course! Our finances would be well managed. Date night would happen on schedule. I would never neglect him to focus on the children. My work would get done on time leaving plenty of room for quality time. I would always be in the mood–like there was a switch I had access to. I would always be pleasant and live a life that proved I was grateful for this man. I would never argue–every time I would open my mouth to say something rude–gratefulness would surely overwhelm me. Right? One thing I’ve learned is when you wait on God, he will bless you with someone who can be understanding about your shortcomings. Many of the ways I desire to change, don’t occur to my spouse because he isn’t thinking about them. They aren’t on his priority list in the way they are bolded, highlighted, and circled on mine! Another thing I’ve learned is God is with me in the process. Though I loved and still do enjoy planning–God helps me to plan realistically. Am I going to wake up and suddenly be all I ever wanted to be tomorrow? Definitely not. (I’ve tried it. As though 8 hours of sleep doubles as a spell that makes your dreams come true). But I’ve come to learn it doesn’t mean I should throw in the towel altogether. It’s not about me planning to the point where I reach perfection. It’s about partnering with God to grow daily–moment by moment. It’s about apologizing and applying more restraint each time I say something unpleasant. It’s about doing what I can…in increments. I had a beautiful talk on this the other night where a wife said, “let go of this idea that you need to be the perfect wife. Every season will look different so don’t expect yourself to be able to put the same effort and attention into everything all the time. There’s a season where you can focus on yourself. There’s another where it’ll just be you and your husband. And now that you have a child, things have to shift. If you guys have more children, things will shift again. So choose flexibility over perfection.” That was an on time word! 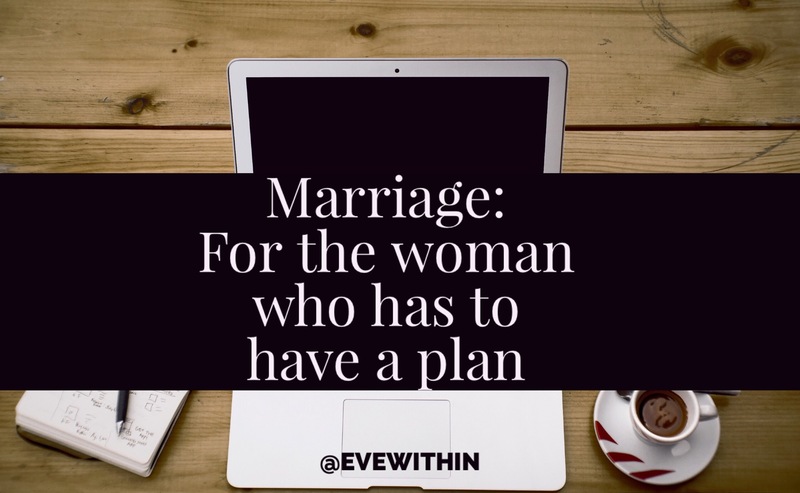 For the wife, fiancé, girlfriend, or single woman who is constantly planning: plan to co-labor with God. Leave what the task looks like up to Him. Just plan to be open and teachable. You’ll grow one step at a time. thanks so much! did anything stick out to you?